My uncle has a passion for Boun Suang Heua (Boat Racing Festival). 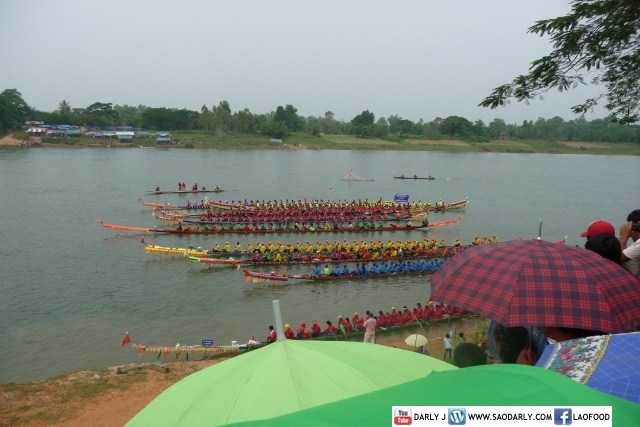 He would travel around the country whenever he could to attend Boat Racing Festival in various provinces of Laos. With work and family he can’t attend all of the races but would make sure he could go to Ban Ling San Boat Racing Festival and Vientiane Boat Racing Festival. This year he was able to convince his wife and all of his children to go with him. It was a family day out for food and fun at Ban Ling San Boat Racing Festival. There has been major improvements to this village with paved road and well organized event. People from near by towns would gather along the river to watch and cheer their favorite teams. There are plenty of games and carnival rides to keep the children busy. The adults can do some shopping and buy all sorts of things from the festival vendors. When they get hungry, there are plenty of food stands selling Tam Mak Hoong, Ping Kai, Khao Larm, and other dishes and snacks to keep the festival goers happy. I like your website a lot, specially when you talked about papaya salad that is one of my favor. Actually, i loved them all. Your video are everywhere on You-tube nice i like get. Lets me introduce my self. My name is Akhom and I’m from the us and i grew up here but i was bored in Laos same as you. I feel good when i talk to someone 100% from Laos. I always wanted go to Holland but never have a chance…maybe this summer, but will see. 4 yrs ago i was in France and Belgium. It would be an honor to have you as “long distance friend”. Please let me know and thank you for sharing your website!